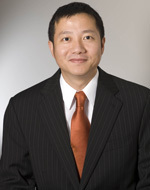 Congratulations to Prof. Hubo Cai, 2nd place recipient of the 2010 ESRI Award for Best Scientific Paper in Geographic Information Systems for his co-authored paper titled, "Accuracy Evaluation and Sensitivity Analysis of Estimating 3-D Road Centerline Length Using LIDAR and NED." Written by Prof. Cai and William Rasdorf, this paper proposes an approach to model transportation linear objects in a 3-D space and estimate their 3-D lengths using planimetric road centerline data and elevation data (LIDAR and NED), and quantify the accuracy. The award is presented by the American Society for Photogrammetry & Remote Sensing.